RIYADH, Saudi Arabi — As Saudi Arabia considers digging a moat along its border with Qatar and dumping nuclear waste nearby, Secretary of State Mike Pompeo arrived in Riyadh on his first overseas trip as the nation’s top diplomat with a simple message: Enough is enough. Patience with what is viewed in Washington as a petulant spat within the Gulf Cooperation Council has worn thin, and Mr. Pompeo told the Saudi Foreign Minister, Adel al-Jubeir, that the dispute needs to end, according to a senior State Department official who briefed reporters on the meetings but who was not authorized to be named. Last June, Saudi Arabia and the United Arab Emirates led an embargo by four Arab nations of Qatar, accusing the tiny, gas-rich nation of funding terrorism, cozying up to Iran and welcoming dissidents. Years of perceived slights on both sides of the conflict added to the bitterness. Mr. Pompeo’s predecessor, Rex W. Tillerson, spent much of his tenure trying to mediate the dispute, which also involved Egypt and Bahrain, but without success. The Saudis, keen observers of Washington’s power dynamics, knew that Mr. Tillerson had a strained relationship with President Trump and so ignored him, particularly because Mr. Trump sided with the Saudis in the early days of the dispute. But Mr. Pompeo is closer to Mr. Trump and thus a more formidable figure. And in the nearly 11 months since the embargo began, Qatar has spent millions of dollars on a Washington charm offensive that paid off earlier this month when its leader, Emir Tamim bin Hamad al-Thani, had an Oval Office meeting with Mr. Trump during which the president expressed strong support for the tiny country. So Mr. Pompeo came here to deliver the same message to Mr. Jubeir at an airport meeting Saturday afternoon; to Crown Prince Mohammed bin Salman later that night; and to King Salman in a meeting planned for Sunday: Stop. Confronting Iran, stabilizing Iraq and Syria, defeating the last of Islamic State, and winding up the catastrophic civil war in Yemen are seen in Washington as increasingly urgent priorities that cannot be fully addressed without a united and more robust Arab response. 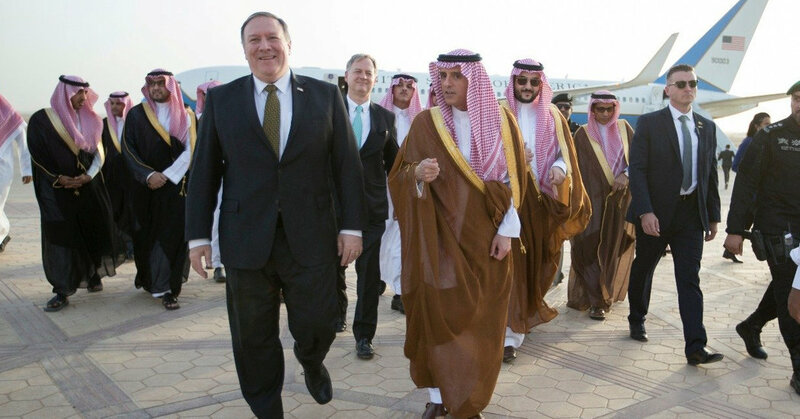 Mr. Pompeo arrived in Riyadh on the same day that Houthi forces in Yemen shot eight missiles at targets in the southern Saudi province of Jizan, killing a man. The fusillade was the latest sign that Yemen’s blood bath is a growing threat to the region. The vast humanitarian crisis in Yemen has become such a keen concern on Capitol Hill that influential senators have begun discussing restrictions on arms sales to Saudi Arabia. That would undercut other administration priorities, including an effort to increase such sales as well as attempts to get the Saudis to play a more active role in stabilizing Syria and opposing Iran. Poor targeting by the Saudis in airstrikes, as well as the kingdom’s blockade of Yemeni ports, have done much to worsen the humanitarian situation in Yemen, and Mr. Pompeo told Mr. Jubeir on Saturday that Yemen must have easy access to humanitarian and commercial goods, along with fuel, the State Department official said. On Sunday, Mr. Pompeo is scheduled to arrive in Jerusalem for talks with Prime Minister Benjamin Netanyahu of Israel. Then he will head to Amman, Jordan, for discussions with King Abdullah. President Emmanuel Macron of France and Chancellor Angela Merkel of Germany both came to Washington this past week to urge Mr. Trump to preserve the Iran accord. Mr. Trump has vowed that, regardless of what happens to the nuclear accord, Iran will not restart its nuclear program, something Iranian officials have said they may do if the United States abandons the deal. Mr. Trump has also vowed to pull American forces out of the Middle East’s grinding conflict in Syria, asking other countries to bear more of the burden. Whether the United States succeeds in persuading allies to do more there, while telling the Saudis to back down over Yemen and Qatar, is far from certain. And how the Iranians view Mr. Trump’s threats while he pulls troops away from Syria is also unclear. On Monday, Mr. Pompeo will return to Washington to help Mr. Trump prepare for a risky summit with the leader of North Korea, Kim Jong-un, whom Mr. Pompeo met on a secret trip to Pyongyang over Easter weekend.